The British Pie Awards 2013 title of Supreme Champion was won by The Pie Kitchen with their Chicken, Chantenay Carrot and Bacon Pie. For a full list of winners click here. For our review of the day read on! It might seem hard to believe but The Pierateers have never actually been to the British Pie Awards before. It is such a busy schedule trying to manage eating and reviewing pies with the day job that it just has never quite been possible before. That changed this year as Pierateers SJL and RAS offered their services to help out with the 2013 event. It was fascinating to see behind the scenes at what must be one of the biggest events of its kind in the world. Certainly there will be nothing like this elsewhere in the world as there is nothing like a British pie. 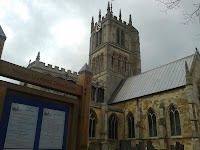 The venue is St. Mary’s Church in Melton Mowbray which sounds strange to hold such an event in a Church but as it is spacious this worked quite well. Melton Mowbray is an ideal location, it seems like the passion of the locals really does make it the heart of rural food production in England. They certainly put a lot of effort into hosting the British Pie Awards which is run by the Melton Mowbray Pork Pie society. 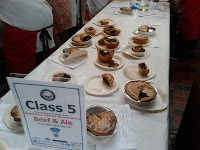 There were 20 categories with judges assigned in pairs with two to eight judges per category depending on the number of pies in that category. This gave a record breaking total of 983 pies! One of the most bizarre moments was the part where the Vicar of the Church announced that we were going to sing a hymn…. about pies. This was to the tune of all things bright and beautiful. It was one of those ‘is this really happening’ moments. The head judge Alan Stuart from the Scotch Pie Club gave the opening guidance to the judges on how to score the pies. This was professionally done with test pies for the judges to gauge their scoring against. 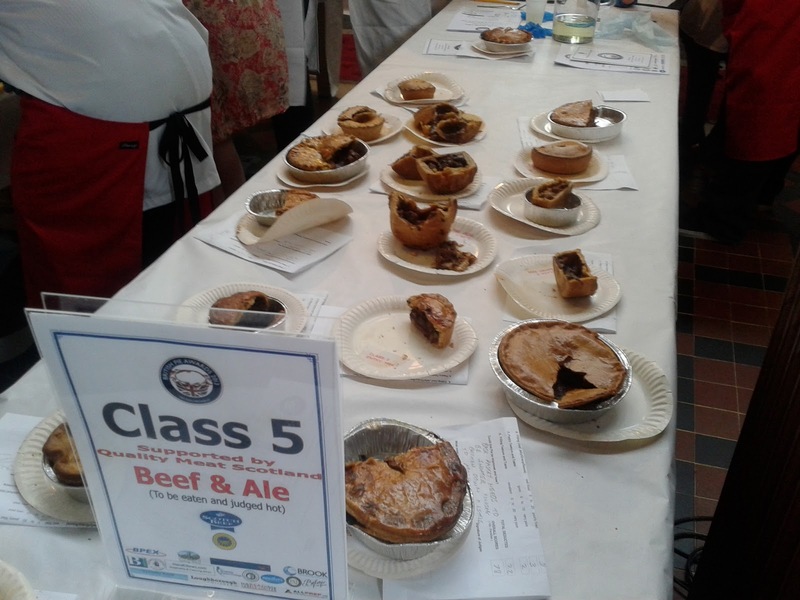 Once scoring proper began the judges would sample a small amount of the pie in their pairs. Rather than assigning a score points would then be deducted for things that were wrong with the pie. The pies were given to the judges without any identification as to what the pie was so as to ensure there was no bias. The operation to keep the judges constantly supplied with pies was no mean feat! There were a range of ovens with cold pies constantly going in as hot pies came out. 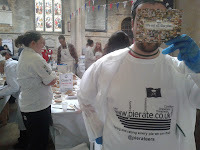 The pierateers were involved in the team of volunteers taking hot pies to the judges. It was important to get each pie to the judges when it was hot and fresh which was generally achieved. Pierateer SJL was assisting with Class 5 – Beef and Ale while Pierateer RAS was on the table with the Class 10 pies – Other Meat. There were some controversial incidents. A couple of rogue chicken pies were found in the beef and ale pies in addition to an ale free variety. Someone had also sent along a selection of 6 mini pies although it is clear that only one pie is judged in Class 5. This meant a tiny sample for the judges! In addition there were some pies with sizeable holes in them. Considering a pie should be ‘completely enclosed in pastry’ by British Pie Award rules this is a fine line to tread. However they were generally considered to not break the rules. The event was generally organised well. It must be a bit of a logistical nightmare to sort all the pies and have enough people on hand to help. The judges generally seemed professional about scoring their pies although there were some pies the pierateers noticed were scored fairly low when we have assigned the same pie a high score ourselves. Some of the judges did have a lot of pies to score and some commented on being sick of pies by the end. I think naturally those at the end had a disadvantage but this is always difficult to avoid. The judges seemed to try to mitigate this in their scoring. It must also be noted that the Pierateers take cost into account where as the British Pie Awards don’t do this. The judging started about 12:30 and went on for at least two hours and much longer in some categories. The fish pie category in particular seemed to have many more entries this year and only two judges so took a long time. The pierateers heard comment that there still weren’t any fish pies which stood out especially. There were some spectacular pies, including a wedding pie in the speciality section! Take note anyone with a wedding soon! One sad thing to note was the amount of waste pie. Normally only a small amount of pie could be eaten by the judges so the rest of the pie was thrown away. There could perhaps be some way of recycling this waste pie, perhaps sending it to a local dog sanctuary. It was sad to see the creations people put so much time into going into the bin! Once all the pies were judged the scores where collected up and the winners were announced the next day at the awards lunch. Congratulations to all the winners, especially the Supreme Champion, The Pie Kitchen with their Chicken, Chantenay Carrot and Bacon Pie (click here to see our review). At the time of the awards there were no winners which had been reviewed by The Pierateers (although we have since put that right!). This goes to show just how many pies there are out there! 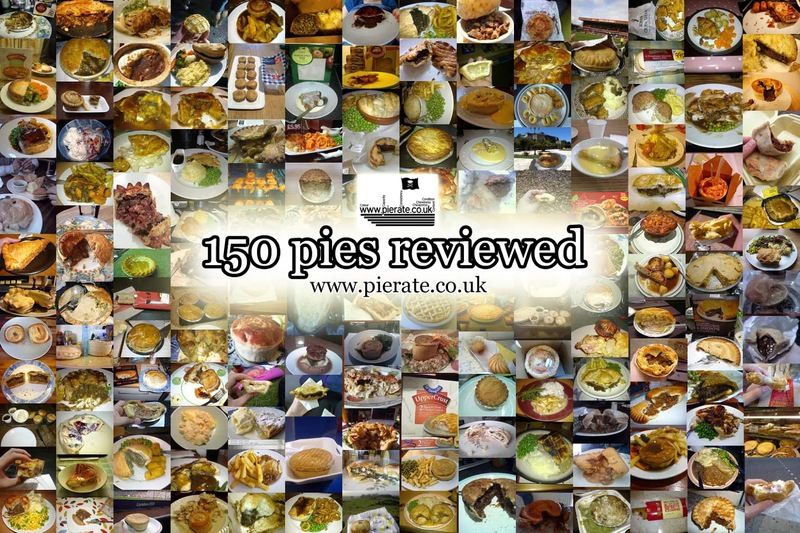 Pierate is a pie review website on a search for the ultimate pie. For all the pies we have reviewed have a look at our Pie Rankings or find pies of a particular flavour under Pies: Categorised. 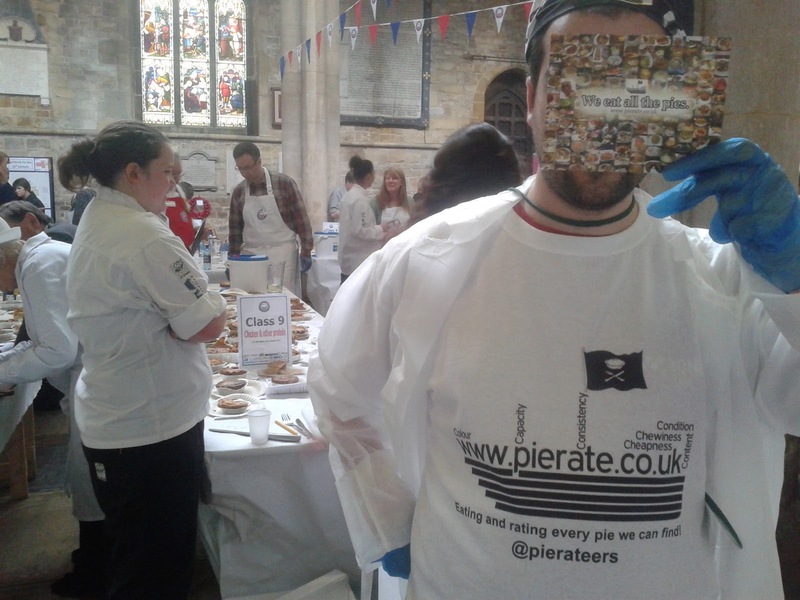 continue reading "British Pie Awards 2013"
Hopefully many of our loyal pie fans will have been keeping up-to-date with the ins and outs of the British Pie Awards through https://twitter.com/pierateers yesterday, as two of the Pierateers lent a helping hand as "Pie Stewards" at the 5th annual British Pie Awards. However for those of you who don't know your hashtags from your retweets, here is our take on the British Pie Awards 2013! An early start to get to the #bpa13 , who knew Melton Mowbray was so far away? Watch out cos the pierateers are coming! 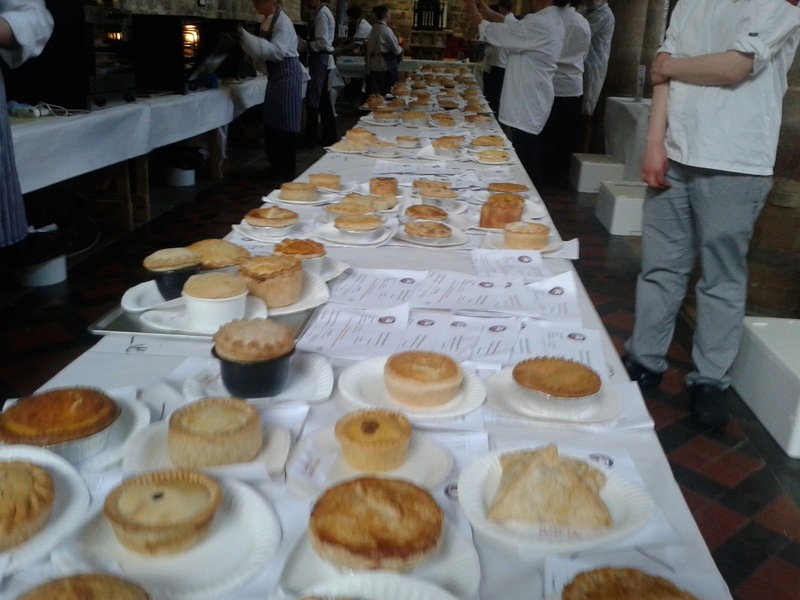 983 pies are to be judged at the British Pie Awards this year @BritishPies That is going to look and smell terrific! Hope we don't drop any. Finally on my last train from Ely to Melton Mowbray for #bpa13. It takes a while but it's all worth it if you keep your eyes on the pies. For full details and all the latest pie news (about the British Pie Awards and beyond!) follow @pierateers on twitter! continue reading "Tweeting at the British Pie Awards 2013"
The British Pie Awards 2013 take place on Wednesday 24th April 2013, with winners announced at an Award's lunch the following day. The BPA judges will be looking for Britain's best pie. Pierate is thrilled to announce that two of the Pierateers will be volunteering as "pie stewards" at the event. The organisers have announced that this will be the biggest BPA ever, with nearly 1000 pies entered. That's a lot of pie! Who do you think is tipped to win? Do you have a favourite? Have a look at our Pie Rankings and see how the pie scores stack up. Since 2013 we've been judges at the British Pie Awards in 2014 and are also covering the British Pie Awards 2015! continue reading "British Pie Awards"
So with it being St George’s Day and all, I thought I’d try out a great British classic while out for dinner. Of course, it will come as no surprise to our loyal fans that I went for the Steak Pie! I’m sure St George would have been proud. After all, you can’t slay dragons on a pie-empty stomach! Did you know? Currently when you type "pie review"
into Google, the top result is www.pierate.co.uk! However, it has to be said that there was some controversy surrounding my choice. 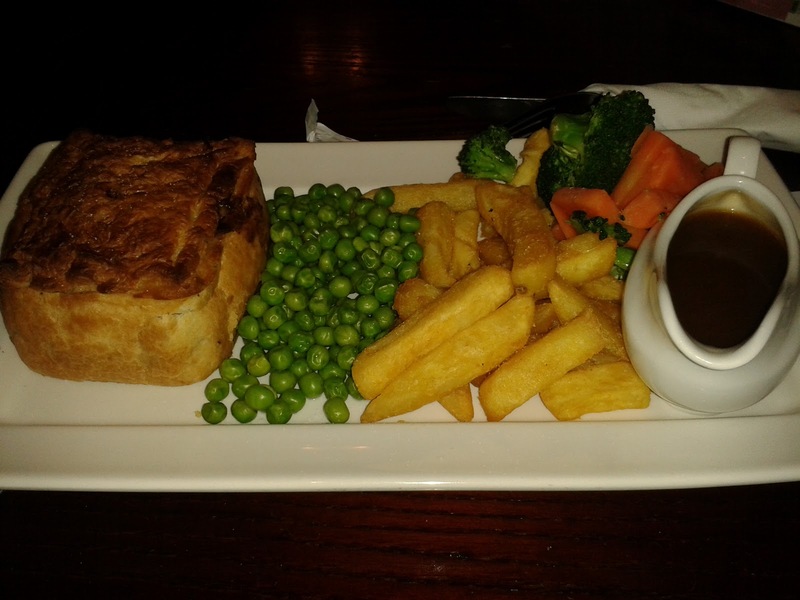 Because, for those who have frequented a Wetherspoon pub in the past few weeks, they will find – like I did tonight – that there is not actually pie on the menu at the moment! I know! That’s what I just said – no pie on the menu! So after the controversy of ordering a pie, how did it rate? The pie itself was well presented. A solid, decent sized square pie, which was fully encased and golden brown. It certainly was looking promising for a snip at £4.99. Upon digging in, the top crust lid was deliciously light and flaky and the gravy was nice, however it didn’t take too long for the pie reviewer to come to some rather thick, dry outer pastry around the sides. While possible to cut through with a standard knife and an accompanying gravy boat to aid in softening the pastry shell, there was no doubt that this certainly let the side down (pun intended). It was quite a disappointment, as the top pastry was absolutely crisp and delicious. The meat itself was relatively decent, but not as tender as some of the farm shop/farmers market varieties out there which top our rankings table. A bit of gristle was unfortunately found to, which never goes down well. Overall, while quite a decent capacity, the thick, dry pastry sides meant that this pie didn’t quite weather the storm of pie rating. I would probably need a spoon (and perhaps a steak knife) to get through all the pastry provided to. My recommendations would be that a bit of lighter pastry round the edges and slightly higher quality meat would certainly boost this pie’s appeal. However, the old adage goes that you get what you paid for, and on a budget of £5 for a pie meal in a pub, I don’t think you can find many that would compete on value. For pie on a budget, I certainly wouldn’t rule out going back to a Wetherspoon pub... oh, once they add it back onto the menu, that is!!! continue reading "Whatever the weather a Wetherspoon pie makes you better"
In our recent quest to try every Pieminister pie, I yet again returned to Pieminister in Farringdon, London - this time to hunt down the Deerstalker Pie, which is another pie like the Pietanic which is hard to come by. The Deerstalker is a venison, dry cured bacon, red wine and lentil pie - which I believe is relatively new to their range. Compare all our Pieminister Pie Reviews - and we've reviewed a fair few in our Pie Rating careers - on our Pieminister Pie Reviews Page! 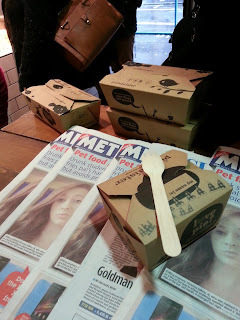 Again, we have the traditional crunchy Pieminister pastry that I think is characteristic of the brand. Once you've broken through the crunch, you are rewarded with some nice tender chunks of venison and a deliciously rich sauce. We've tried a venison (and prune) pie before, which didn't sit too well, so I was apprehensive about trying another venison pie. However, I'm glad that I did because this was very pleasant. It is a bit expensive at £4.20 however - for which you get just a pie in a box with some gravy and a wooden fork. Still, pie was good. I'm starting to think this Pieminister pastry might be a bit dry and hard, and doesn't mix well with the rest of the pie. I like it because it's different, but then the pastry can sometimes feel a bit of a meal in itself. The fact that it doesn't soften into the filling means it becomes a bit of a separate entity and becomes detached from the pie - detracting from the overall "togetherness" and "unity" that a pie should possess. Still, they've pulled off a venison pie very well here I think. Venison is a tricky ingredient, but the rich sauce compliments the tasty venison very well. 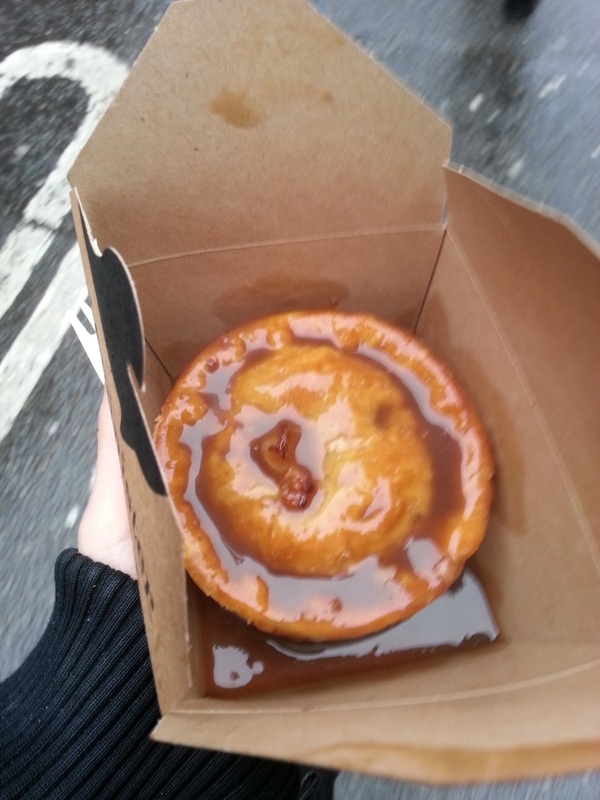 See where this pie ended up in the Pierate Pie Rankings or find other pies of a similar flavour - as well as all the other Pieminister pies. 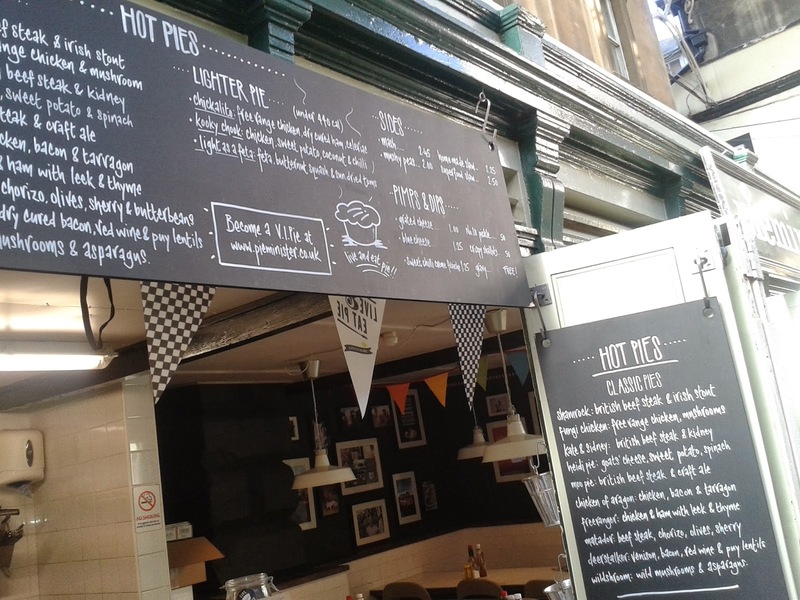 continue reading "Pieminister Pie Review - Deerstalker"
Pies – do they bake well in Bakewell? Well, we’ve all had a Bakewell Tart, but what about a Bakewell Pie? Does a pie baked well in Bakewell taste well good as well? To find out, I’ve travelled to Bakewell in the Peak District, Derbyshire. But I’m not on the look out for a tart, no, for a tart is not totally and wholly encased in pastry. Put some pastry on the top of a Bakewell tart and I might be interested, but today is all about the pies only please. I spot a little outfit called ‘The Bakewell Tart Shop’ that proudly proclaims it sells “Award Winning Pies.” What award exactly is anyone’s guess – perhaps it was a British Pie Award? 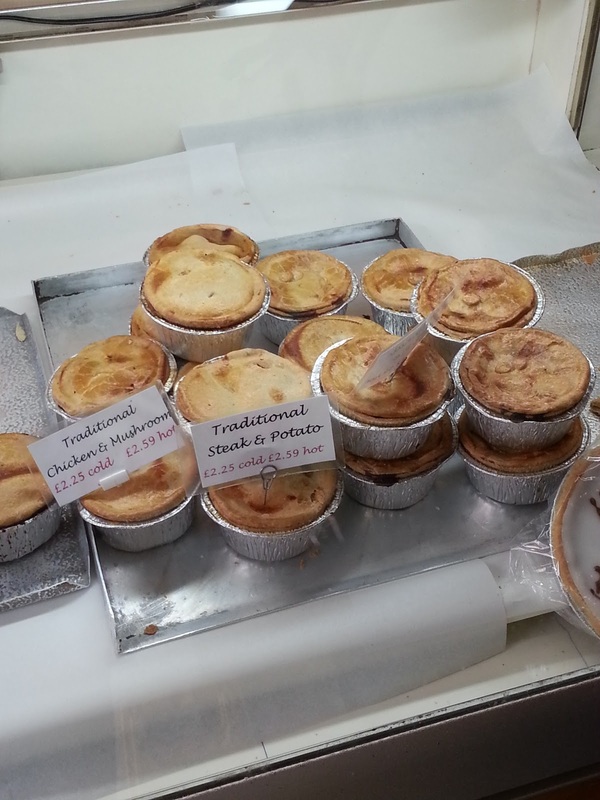 Anyway, regardless of which award they’ve won, any shop that calls it’s pies ‘award winning’ must be pretty proud of their pies, and so I want to try them. There’s a sign on the wall that mentions something about Dales Pies – so these pies could be Dales Pies although I can't find any on their website that look similar. I ask the shopkeeper behind the counter whether there was any specific pie that was particularly ‘award winning’, and she tells me that the steak pie is probably their best seller. So that’s it, decision made, I plump for one ‘traditional steak pie’ that comes warmed at £2.59. Oh dear, error, that was silly. I want the pie as a take-away, and so for it to be warmed they’re going to have to microwave it. As any pie aficionado knows, you should never microwave a pie (unless it’s a specifically microwaveable pie such as Pukka Pies 4 Minute Pie). Still, too late, the pie in the microwave and I am going to have to live with my mistake. This is the pie in question. It’s definitely a pie, and not a tart. Before it went in the microwave, the pastry had a bit of a matt-finish to it, but after the microwave-job the pastry is glistening and looks a bit greasy. There’s no crispness to the pastry anymore – it’s just a bit flabby and rubbery. I’m fairly sure that’s the fault of the microwave, however – and that’s why you should never microwave a pie. Still, how is the pie itself? The steak is quite nice, and you get some good sized chunks with no gristle or fat. It’s not too chewy either. There is a favourable amount of nice tasting gravy too, which fills the pie to nearly its full capacity. However, when you’ve been around the pie eating block for a while, some simple steak and gravy doesn’t really cut the mustard anymore. There wasn’t any excitement here. It was a simple steak pie. Too simple for me. It tasted very pleasant, was cheap for a hot pie, and was comforting, but had no pizazz or boom. The pastry was also fairly standard pie pastry. Nothing wrong with that, but I like to see crimping, I like to see innovative shapes, I like to see that some fun has been had constructing that pie. 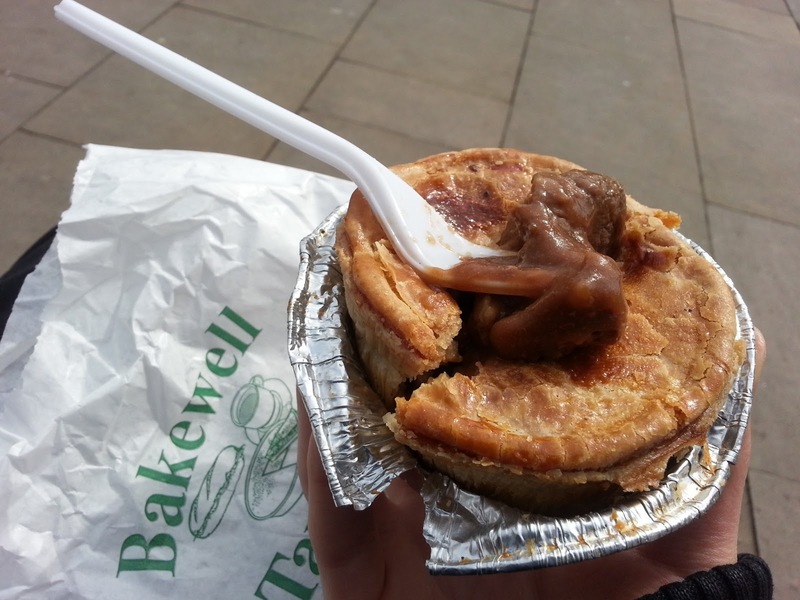 continue reading "Pies – do they bake well in Bakewell?" When in Wales... eat Rhug Estate Pies! “When in Rome...do as the Romans do” goes the old adage. Well, I wasn’t in Rome, but I did spend my birthday in Wales. At the New Word Alive Conference in Prestatyn, North Wales, to be precise. So while in Wales, I thought I’d do as the Welsh pie eaters would do and order some top Welsh pies to be delivered to me while on holiday! So having found an award winning welsh meat producer online via the “Wales The True Taste” website, a few emails and phone calls later and the really friendly Rhug Estate Farm Shop manager Ynyr Jones pulled up in Prestatyn with 12 pies for my birthday – the 10 that I had ordered, plus very kindly supplying two free birthday pies. I had to use a lot of self control in waiting for my actual birthday day to consume these pies, which had been delivered a few days prior. Ha-pie Birthday Greetings and Pies! 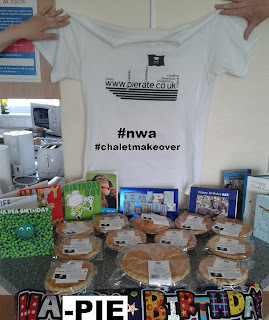 So... as it was my birthday and as there was a competition at New Word Alive to decorate your chalet (#chaletmakeover), I decided “who wouldn’t want to decorate their chalet with pies? 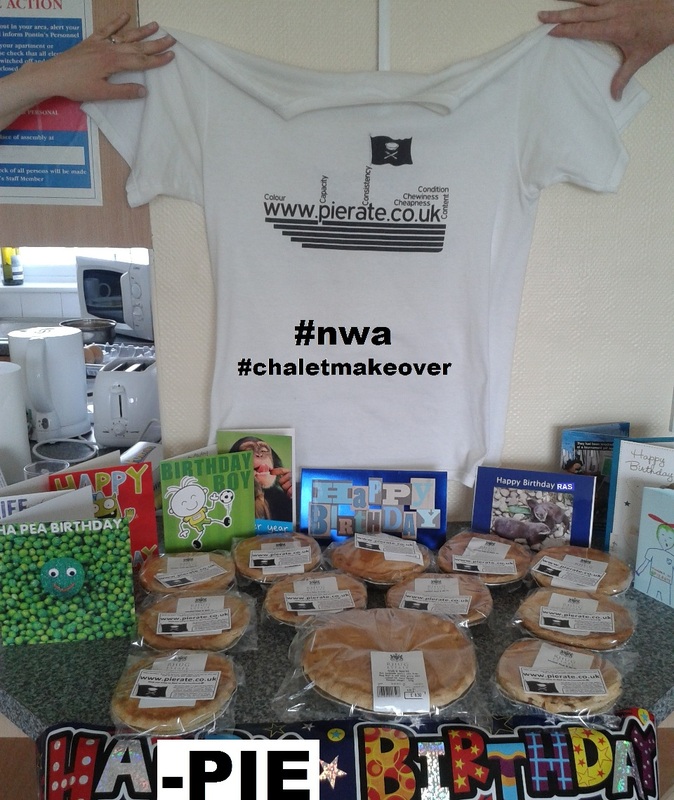 !” Of course, I had my Ha-pie Birthday banners and cards in there to, from family and friends including the awesome NWA Under 5s team I was serving with. It is also worth noting that these pies were eaten as part of a three-pie-course meal on the Monday with good friends (pie starter, pie dinner and pie dessert!) and as part of a City BBQ & pie sesh on the Wednesday. Firstly, an overview of the pies as a whole, before the more specific pie flavour comments. You could tell these were top, homemade pies as soon as you took the first bite. They were – of course – fully encased, with a clearly defined base, sides and lid. The pastry was golden and the meat and/or cheese inside them were top quality. Like a few pies I’ve eaten recently, I’d recommend that the pieces of meat were cut up into slightly smaller chunks and more evenly dispersed throughout the pie, to avoid having bites of pie containing no meat and others that are overly-meaty. However I could not fault the meat itself, with absolutely no gristle and just tender meaty goodness. 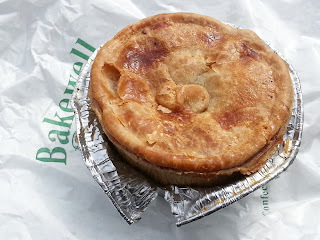 The pies were quite shallow though, which did mean there wasn’t as much content as I’d like. The capacity was very strong for the size of the pie, with the meat pieces bursting out of the pie as soon as you cut into it. However due to the shallowness of the pies, this did mean the filling to crust ratio wasn’t quite as strong as it could have been. That said, the filling that I was presented with was very good. It was a reasonably thick crust (needed to hold in the tender meaty chunks) and with a bit more filling these would be challenging right at the top of the pie rankings. The price was very reasonable indeed (especially considering the delivery to) and I’d happily pay a bit more for a deeper, larger capacity filling to go with the golden crust in future. This was the award winning pie amongst the batch, with it winning the Silver Award from the Guild of Fine Food (2004). The mix of cheese and steak was a very nice combination, with the stilton adding to the beef gravy flavour. 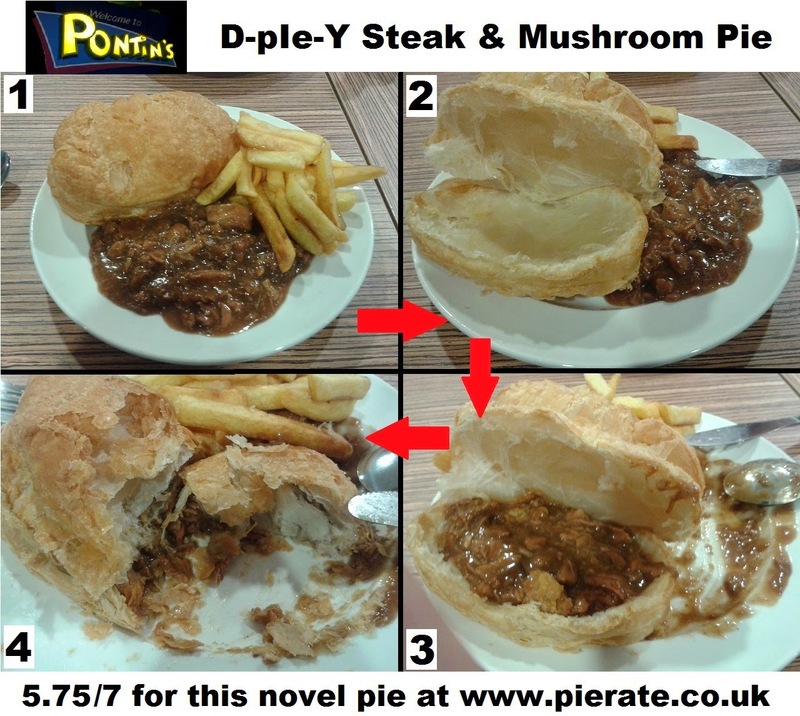 The steak chunks were very tender and delicious, and with a slightly more even distribution of meat pieces this top pie would be even better, for a mouthful of stilton/beef gravy, without any steak, was certainly a lot less enjoyable! The filling complimented the golden crust well and was my preferred pie on the night. The Steak and Onion pie certainly had a strong steak flavour to it and was aided by it being a family sized pie (the others were individual pies). The filling to pastry ratio was therefore a lot better for this family sized pie and the chunks of steak far better distributed. The onion was well concealed within the pie gravy, as opposed to being large chunks of onion. It added to the gravy flavour for those who like onion gravy but did not overpower the steak itself. There was quite a strong mushroom flavour to this pie but the red wine gravy certainly added to this pie’s flavour. The steak was once again lovely and tender and was well complemented by the flavoursome gravy. 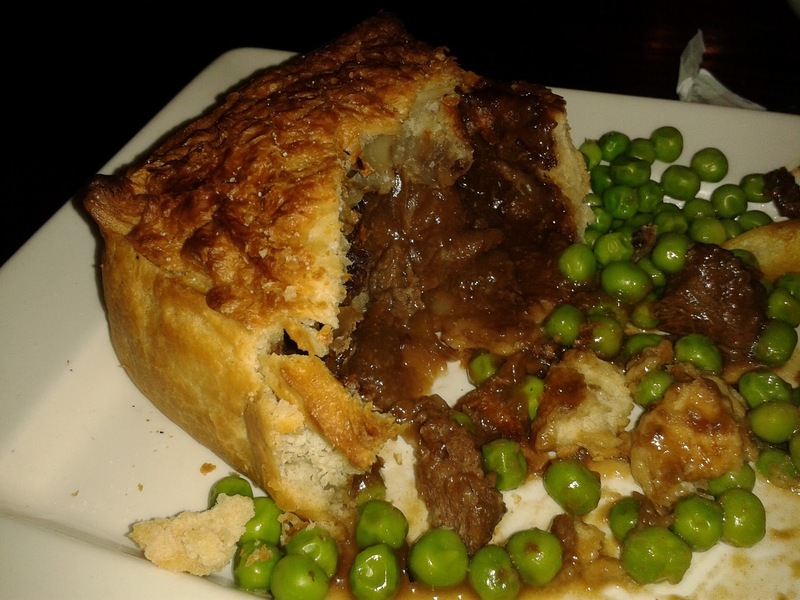 The steak and ale pie was again full of very tender, delicious steak. The ale gravy was good, however nothing spectacular (considering the wide range of steak and ale pies available up and down the country). The ale taste was quite light which meant it did not over dominate the pie flavour, however possibly to the detriment of not really being able to taste the ale much at times. The chicken inside this pie was once again very tender and served the pie well. It was a creamy sauce within this pie, rather than the more traditional white wine sauce which frequents many a chicken pie. I personally did not really enjoy the sauce within the pie that much, hence why this flavour doesn’t score as well as the others. I did not feel it complemented the meat like the beef gravies complemented the steak. However the meat and pastry were still very good. Featuring Llandyrnog Mature Cheddar, you certainly did not miss the cheesy kick you got from a bite of this pie, which did also include potatoes, Swede, carrot and onion amongst other things. Not having had a cheese pie before to compare it to, I was pleasantly surprised with how well it tasted, considering it was a savoury pie with no meat content. However it must be noted that this cheese pie is unfortunately not suitable for vegetarians due to containing lard as an ingredient. Overall, it was a nice tasting piece of pie, but I feel it could get a bit sickly if eaten in too large a quantity. 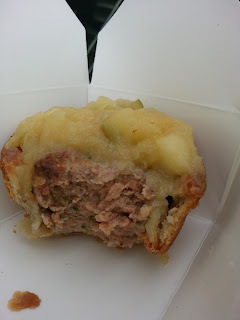 continue reading "When in Wales... eat Rhug Estate Pies!" Once again volunteering on a Christian holiday conference called New Word Alive, on the Pontins site in Prestatyn, North Wales, it was a delighted to see that there was a new addition on the catered food menu. While I’d had a rather unflattering piece of cold apple pie last year, which sadly rated very low on the Seven Cs, this year they had added a steak and mushroom pie to the menu. Well... I say the added a steak and mushroom pie to the menu. That was certainly what was listed on the food menu board... however what I found when I got to the food bar was not at all what I was expecting! As can be seen in image one, they were serving one tray of steak and mushroom pie filling... and in another tray the puff pastry crust! This was D-I-Y Pie! Or as I’d prefer to call it, D-pie-Y! Stage 4: Enjoy your pie! So I guess the most important thing – whether you have to put together your own pie or not – is what the pie actually tastes like!!! And the good news is that Pontins have done a cracking job of upping the steaks... (get it?!) and actually provided a very tasty pie this year. The puff pastry was really crisp and flaky with a lovely golden colour, and a lot lighter to eat than having a fully encased short crust pie. 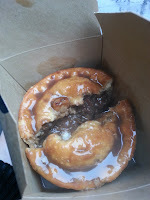 The filling was very nice, full of tender meaty chunks of steak, soft mushroom and very nice beef gravy. Some of the pieces of steak were a bit fatty but overall it was a very pleasant pie filling which complemented the puff pastry well. The content was therefore on the whole very good, and the main slightly confusing aspect of this pie was that the capacity of the pie was actually up to the pie eater (and therefore not the pie maker) to decide! I for one decided to maximise my pie filling to crust ratio, ensuring I got plenty of meatilicious content. continue reading "Pontins D-I-Y pie... D-pie-Y!" So on the occasion of the house warming of ex-housemate Seth’s new home, the dessert was a welcome home-from-home: apple pie! It’s as if he knew about my love of pies... In any case, I certainly wasn’t going to struggle to find a “home” for the Bramley Apple Pie by Sainsbury’s. Like its Blackcurrant and Apple Pie cousin, the Bramley Apple Pie was very good. The pastry was lovely and crisp, giving a good firm crunch which complemented the fruity apple content. The apple pieces were quite crunchy in parts but the apple sauce filling was very good and not overly sweet. An own brand pie, but at the more luxury end of the spectrum, the pie is well suited for three hungry eaters or four more normal portions. The pastry did crumble somewhat upon cooking but this did not detract from the delicious taste. Well worth a purchase! And here’s to many more tasty pies in the new home! 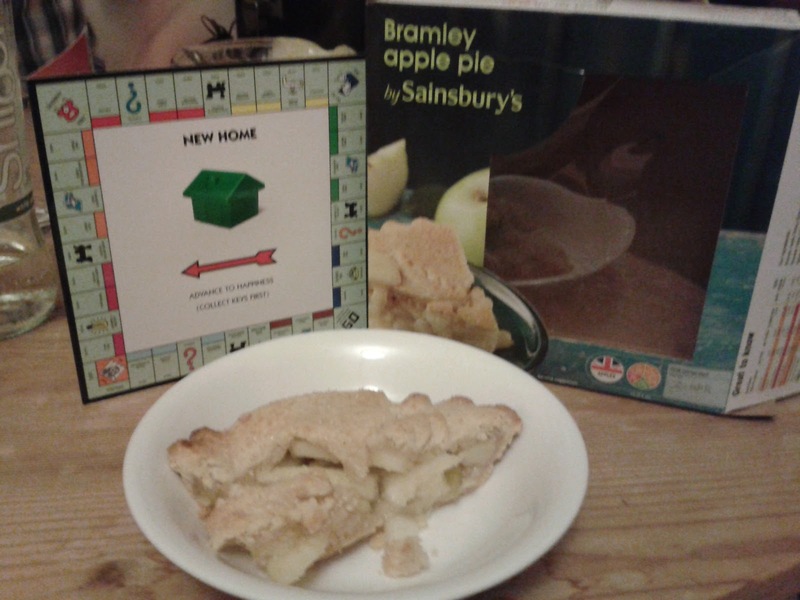 continue reading "Housing the Sainsbury’s Bramley Apple Pie"
Commitment to pies in general, and to the Pierate blog more specifically, is something that us Pierateers take very seriously. For our passion for pies goes beyond merely appreciating the taste of pastry and filling, but has developed into a slight over fascination in anything related to fillings fully encased in pastry, with a clearly defined base, sides and lid. And for those who uphold our ideals and champion the eating of our favourite dish, we both salute them but also wish to present them with something that money really cannot buy: the title of Honorary Pierateer. Well I am delighted to announce that at around 3am on Saturday 30th March 2013, our second big landmark was reached when the Pierate blog reached 25,000 pageviews! And to celebrate this tremendous achievement, from an additional 15,000 pageviews in approximately 15 months, we are proud to announce our second Honorary Pierateer award to... Rosa Crawford! 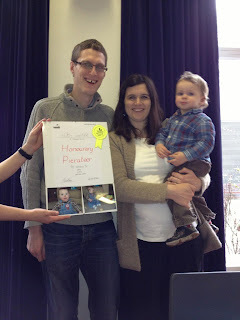 Rosa has been a keen follower of the pierate blog since it began, living with one of the Pierateers for a time and partaking in a number of pie related excursions with several of the Pierateers. However what we would really like to recognise in presenting this award is Rosa’s great service and dedication towards helping the people of Britain avoid what we dubbed “the pietax” (more commonly known as “the pasty tax”). We believe that with Rosa’s great service to the nation, we – the people of Britain – are paying less for our pies than we would have done had the UK Government had their taxation ways! And so to you, Rosa, we thank you! 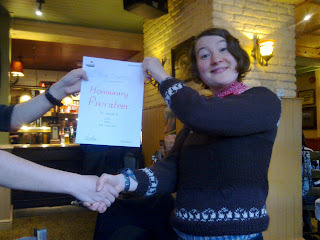 And we award you the title of Honorary Pierateer! continue reading "Honorary Pierateer celebrates the 25,000 page views landmark"
I’ve come to KERB, a pop-up street food marketplace in King’s Cross London where vendors alternate every week to bring some tasty street food to the streets of the city. This week is the turn of Eat My Pies a.k.a. Andy Bates of FoodNetwork fame. He’s turned his hand to pie making, and I’ve heard through the grapevine that his pies are rather good. Eat My Pies is apparently about bringing Great British food to the Great British public - and with an instruction like “Eat My Pies”, I need no further convincing to leave the office and head up to King’s Cross for my lunch. I find the Eat My Pies stall, and sure enough Andy himself is there to talk me through the wide and exciting array of pies he has on offer. I’m tempted by the chorizo pie, but in the end I opt for a warm Pork, Apple and Leek pie. It’s £5, which can initially seem like quite a chunk of money for a small pie, but I’m also well aware this is gourmet pie territory (plus the pie is warm). The first thing you might note about this pie is that it is lacking a pastry lid. Instead, Andy has opted for an apple topping. The pie purists amongst you out there might draw attention to the fact that a pie can be defined by having “a filling that is totally and wholly encased in pastry”, but I’m willing to waiver that rule and give Eat My Pies the benefit of the doubt in this instance. Certainly what the pie lacks in pastry topping, it makes up for in extra chunky pastry sides. As you can see from this cross-sectional view, the pastry sides are mightily thick! Probably a good thing if you’re eating this pie with a knife and fork, but I found this made it difficult to bite into the pie with just my teeth. How does the pie taste? The pork is moist. And herby. And totally, enthrallingly, mesmerizingly delicious. I’ve never had a pork pie like it. This is not your regular pork pie: this is a true taste sensation. In terms of taste, this pie ranks right up there as being one of the most appealing I’ve ever had. The apple works brilliantly with the pork, which is juicy, authentic and flavoursome. It’s a great pie that puts many others to shame. On the whole, the pie looks cool and quirky. It tastes fabulous too. 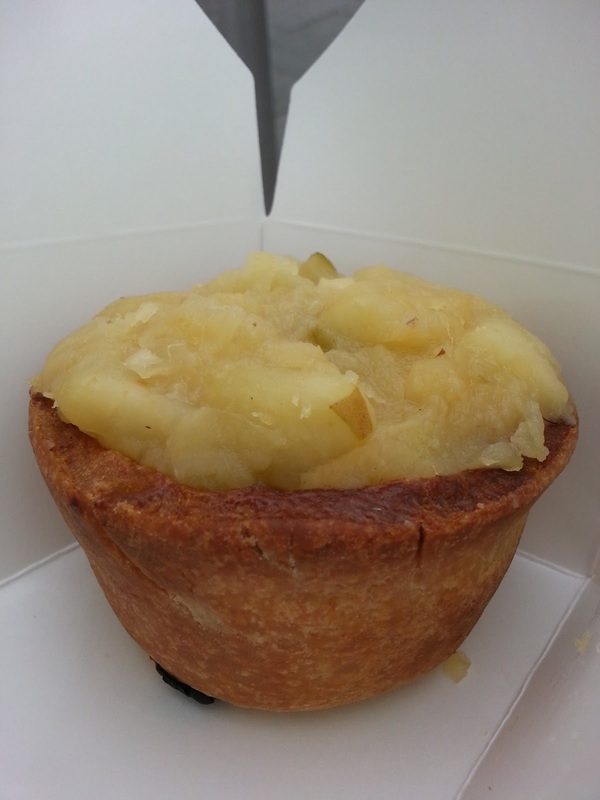 However, it lacks a pie lid, and the pastry sides are a bit too thick to eat comfortably without cutlery. The pie is also a little on the expensive side. Forget that though, it was delicious! Yum. I’d very highly recommend you Eat This Pie. Please note that I would have given this pie 6.49/7, but as there is no pastry lid then it is unfortunately not possible for me to rate this pie higher than 6.
continue reading "Eat My Pies? Okay!"